When a physicist talks about beauty in science, it's usually in an abstract way. Astronomers have Hubble, biologists have flowers and rainforests, and geologists have the Grand Canyon. But what does the public think of physicists? We're all bombs and particle accelerators in many people's eyes. Here's a clear example of why that's not true. 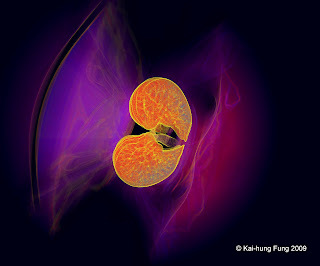 Kai-hung Fung, a diagnostic radiologist at a hospital in Hong Kong, used a little art and a 3D Computed Tomography (CT) scan to create this image. It's called "Cosmic Lungs." The manipulated image is a top-down view of human lungs with the cosmic clouds represented by the blanket over the person's body on the right and the CT table cushion on the left. Fung digitally removed the rest. Fung also won the photography prize in the International Science and Engineering Visualization Challenge in 2007 for his piece "What Lies Behind Our Nose?" You can see more art and read about Fung's process here.